Yesterday, I got lunch at Cho-Cho's, a restaurant that opened a few months ago in Wilkinsburg. Cho-Cho's menu is a medley of Southern foods (ribs, fried chicken, mac and cheese) and African food (fufu, a few other things I can't remember). I'd been particularly interested in it because it advertised ribs, and I'm always on the lookout for good barbecue. I decided to try the unfamiliar options: I got fufu and oxtail stew. I'd read from Wikipedia that fufu is a thick paste made from pounded starchy root vegetables, but I'd never tried it. I was the only customer in the restaurant, so I was able to watch Paul the proprietor at work preparing the food. The fufu was a very labor-intensive process--it required about ten minutes of mixing fufu flour and water, stirring vigorously, microwaving a bit, and stirring and microwaving more. We had time to talk a bit, also: I learned that Paul is from Zambia, and the restaurant is named for his young son (whom I saw roaming around the place). Paul also told me about the African way of eating fufu with one's hands; one pinches off a small bit, dips it into the stew, then and eats. I'm willing to experiment; back at the office, I washed my hands, left the knife and fork in the plastic container, and opened up the container. Wikipedia's picture of fufu was white, so I was expecting something vaguely like mashed potatoes. 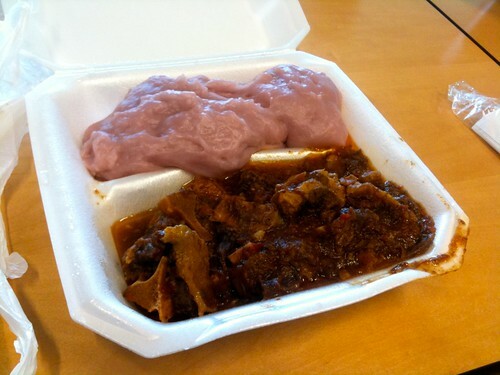 This fufu, though, was pink and looked like an enormous wad of chewed bubble gum. The texture was very cohesive in a starchy way, like unbaked bread dough or overbeaten mashed potatoes. These metaphors make it sound unappetizing, and that's not really appropriate; instead, it was just mild and innocuous. The oxtail soup, though, was very tasty, with lots of braised-beef flavor. There was also a lot of bone and fat to eat around, but I think that comes with the territory of oxtail soup. Paul encouraged me to come back in a week or two to try the egusi soup he hopes to add to the menu. I'll give it a try at some point.